Former Vice President Al Gore hits the campaign trail for Democratic presidential nominee Hillary Clinton today in an effort to mobilize young voters on climate change. Photo courtesy of the United Nations Framework Convention on Climate Change. Hillary Clinton will highlight Donald Trump's comments maligning climate science at a Miami campaign rally today with Al Gore, according to a Clinton aide who said the event will address a wide variety of climate impacts and policies. This is the first time the former vice president is appearing with Democratic presidential nominee Clinton, as part of the campaign's plan to attract undecided young voters by talking about rising temperatures and their impacts on vulnerable places and populations. The event comes four days after Hurricane Matthew swept along Florida's central and northern coasts, buffeting the state with 100-mph winds and heavy rain. It was unclear if Clinton or Gore would focus on the storm in their remarks. "Clinton will discuss the very real impacts of climate change on American communities, from sea level rise in Miami to historic drought in the West, and highlight locally-driven clean energy and climate solutions," the campaign aide said in an email. The event today seems designed to stir concern among Democratic voters by pointing to the policies that Republican nominee Trump has said he would repeal. Trump has promised to end the Clean Power Plan, the rule established by President Obama to reduce power plant carbon emissions 32 percent, and he has vowed to leave the Paris climate agreement. Those are popular with Democrats, and the idea of dismantling them stands to resonate in South Florida. The sea level there has inched up about 1 foot since 1880, enough to saturate the limestone freshwater aquifer under Miami during some high tides, degrading water quality and causing flooding. The idea that some Floridians are already witnessing the impacts of climbing temperatures makes it likely that Gore will emphasize Trump's past comments that question the science behind climate change, according to Kalee Kreider, a former environmental adviser and spokeswoman for Gore. "I think, first, they'll focus on the climate science denial. It's simple; it's easy to explain," she said. "I'd be surprised if they didn't start there." Trump's campaign didn't respond to requests for comment. Kreider recalled observing Gore draft dozens of speeches, many of them on climate. He would often craft them verbally, dictating long paragraphs steeped in science as someone typed them into a computer. The sessions sometimes happened at 4 a.m., and they often included another aide who would fact-check the details of his monologue in real time, she said. At other times, he would quote the Bible, or a deep thought from some literary work, from memory, she said. Today's speech will likely be snappier. 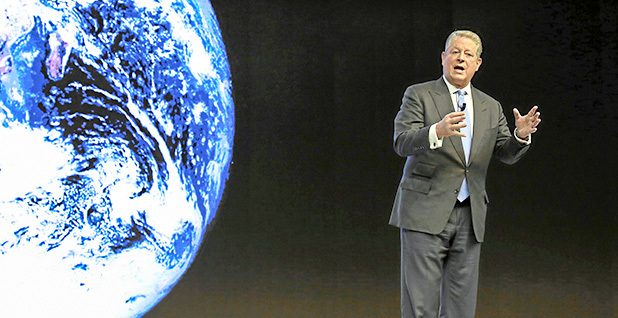 Gore's address in Miami will likely trade his usual scientific discussions about ocean currents and climate forcing for policy-oriented points on renewable energy, the employment successes of the clean-tech industry, and a pitch for urgent action on warming, Kreider said. "And then hitting it home that elections matter," she added. The event today is part of the Clinton campaign's broader effort to attract younger voters. A poll released by Quinnipiac University on Friday showed that 48 percent of likely voters aged 18 to 34 support Clinton over Trump, who is favored by 27 percent. A significant number of them, or 11 percent, prefer Libertarian nominee Gary Johnson, the former Republican governor of New Mexico. Susan MacManus, a political scientist at the University of South Florida, said climate change is an issue that can resonate with Democrats and independents in the Miami area. But she's skeptical about Gore's ability to deliver that message to millennials. "Not," she said, when asked if young voters might be persuaded by the 68-year-old. "I think older voters down there who remember the 2000 election; it would probably be more effective with them." The issue itself is seen as more important in Florida than in other parts of the country. A poll conducted last month with the help of MacManus found that 13 percent of Floridians rank climate change and other environmental issues as the most important priority. That's second only to the economy, cited by 24 percent of respondents in an open-ended question about their concerns. That puts environmental issues ahead of crime (11 percent), education (9 percent), immigration (5 percent), concern about government officials (5 percent), population growth and development (4 percent), and others. Zika, the mosquito-borne illness that can affect pregnant women, was seen as the most pressing issue by 2 percent of Floridians. "That would resonate," MacManus said of sea-level rise and other climatic impacts. Gore's debut with Clinton on the campaign trail is occurring in a state that's critical to her success — and one that delivered a historically stinging defeat to Gore in 2000. No state has a bigger probability to determine the next president, according to FiveThirtyEight. The website says Florida has a 17.4 percent chance to provide the decisive vote in the Electoral College. Analysts say that climate change lacks the salience to move a large proportion of voters to one candidate or another. But it might move a small number, they say, and in Florida, that could make a difference. Obama barely secured the state's 29 Electoral College votes over Republican Mitt Romney in 2012. The final tally was 50 percent for Obama and 49.1 percent for Romney. It was the only state to be decided by less than 1 percentage point. Some environmental groups are describing the election as one of the most consequential tests of climate policy. The League of Conservation Voters, which endorsed Clinton early in the race, said yesterday that it plans to spend $40 million in this election cycle, along with its allies. Among its biggest anticipated expenditures is up to $10 million for turnout operations, and digital and mail advertising in support of Clinton. It's also spending $15 million on similar activities in congressional races. It also anticipates spending $6 million in state races and $7 million on fundraising efforts for candidates. Tiernan Sittenfeld, senior vice president of government affairs at LCV, said that Gore's presence on the campaign trail punctuates Clinton's desire to act boldly on climate change. "We think Hillary knows this is a winning issue, and we're so glad she's leaning into it over and over again on the campaign trail," Sittenfeld said.